The lure that had the biggest impact on American fishing started in the late 1940s in a basement in Akron Ohio. That's where Nick and Cosma Creme cooked up the perfect combination of vinyl, oils and pigments to produce a molded worm that not only looked and felt soft and alive, but also stayed that way when exposed to air over time. 1949 would be the official birth year of the now famous Creme worm. The first marketed worm was the Creme Wiggle Worm. It was sold by mail in 1951 at a cost of $1.00 for a pack of 5. When the product was shown at the Cleveland Sportsman's Show, a distributor sold 9,600 packs to curious anglers in just a few days. The demand soared, and the worm business quickly outgrew Cosma's kitchen. That's when the Creme's set up a small manufacturing plant in Akron. The production was better, but they still had trouble meeting orders as demand continued to grow. 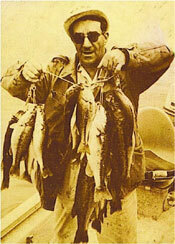 In the late 50s, word of the soft plastic worm began to spread to bass anglers in the South. Many new reservoirs had been constructed in this region and the bassin' was gaining national attention. Creme decided to move his company into the center of the bass activity at the time, and built a plant in Tyler, Texas. Nick began to work with avid bass anglers who came up with many product innovations and rigging techniques. Creme was one of the first lure manufacturers to utilize a field staff network, and Nick used expert anglers nationwide to introduce his worms to other fisherman. Nick Creme died November 29, 1984. Ownership of the company was then passed to his 3 children, and the company continued under the management of his son, Mike Creme. Although smaller than Creme, Knight Manufacturing had made a name for itself in the industry after being started as a garage business in 1965 by Wayne Kent, and his wife, Judy. The company went nationwide in 1976 with its introduction of the Tube worm and continued to prosper with a number of different products. Kent said the two companies had been discussing a merger for more than a year. In 1989 it finally happened. Kent said taking on the tradition of Creme Lure was a challenge. "This is a real traditional company. It created an industry, and we feel very respectful," he said. Today that tradition continues. Creme continues to produce the original Scoundrel worm as well as new and innovative products such as Lit'l Fishie, Mad Dad, Shrimp Tease, and Devil's Tongue.